The Chinese discovered acupuncture more than 5,000 years ago. Chinese science had a very different paradigm than the Western world. It emphasized wholistic patterns, relationships, cycles, and processes. In contrast, the Western paradigm emphasizes linear thinking, causality, and reductionist explanations. Acupuncture was first introduced to Europe by French Jesuits in the 17th Century. It was not widely accepted in the West because of the clash between Eastern and Western paradigms, for example, Western linear thinking couldn’t understand how a needle inserted into the hand could cure a toothache. The acupuncture analgesia did not fit into the existing physiological paradigm of the Western scientist and was thus dismissed. Until 1976, the evidence of acupuncture anesthesia was mainly anecdotal. There were few scientifically controlled experiments. Since then, the situation has changed dramatically. In the last few years, there have been thousands of scientifically controlled experiments in acupuncture. Today, there are at least 17 different lines of scientific evidence verifying acupuncture’s effect upon humans and animals. Research performed on animals and humans shows that specific acupuncture relieved pain while sham acupuncture (needles at acupoint regions) had no pain relieving effect. Several controlled clinical trials on chronic pain patients comparing real acupuncture to sham acupuncture have also shown that acupuncture really works better than a placebo. Perhaps more importantly, when acupuncture was compared to conventional treatment of chronic pain, it was found to be just as effective with fewer side effects. It is evident that needling simulates peripheral nerves in the muscles that send messages to the brain to release endorphins (morphine-like peptides in the brain.) These neurochemicals then cause analgesia by blocking the transmission of painful messages. 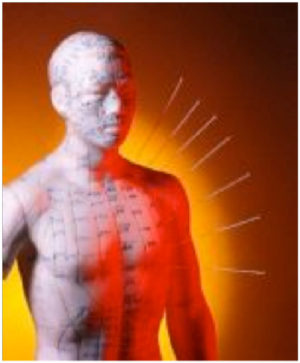 Three main sites for endorphin acupuncture analgesia have been found. The pituitary gland is one site that has been shown to release endorphins into the blood stream. This hormone travels to the three parts of the brain and spinal cord to block the transmission of painful messages. The second site is the periaqueductal gray neurons in the midbrain which release endorphins that act as local transmitters to excite the rostral ventromedial medulla. The rostal ventromedial medulla in turn projects massively and selectively to pain transmitting neurons in the dorsal horn of the spinal cord and the trigeminal nucleus caudalis. Electrical stimulation in the periaqueductal gray and rostral ventromedial medulla produces behavioral analgesia and inhibitions of spinal pain transmission. This third site, spinal cord endorphin system, is where the spinal cord neurons release endorphins to block the release of neurotransmitters from afferent fibers carrying painful messages to the cord. In 1977, research showed that acupuncture analgesia inhibited the spinothalamic tract neurons from responding from painful inputs. This acupuncture effect was then blocked by naloxone, an endorphin receptor blocker. It has also been shown in mice and humans that naloxone blocked acupuncture anesthesia using behavioral measurements. Acupuncture research has progressed since the 1970s to date, to have no less than 17 different lines of evidence convergent upon acupuncture endorphin mechanisms verifying and supporting acupuncture analgesia. The considerable evidence for the three pathways shown above provides convincing proof that acupuncture analgesia is a known physiological phenomenon that can occur and be manipulated through the use of acupuncture needles and electrical stimulation. Testing the involvement of the pituitary, several experiments were carried out, both surgically removable pituitary and suppression of the pituitary endorphins by chemical manipulations; all of the experiments suppressed acupuncture analgesia in animals. Experiments to test the involvement of the midbrain were done since it had been shown that morphine pain relief was largely mediated by this system. Such experiments included direct lesions to the raphe by cutting the output fibers in the dorsal lateral tract, the spinal cord blockade of serotonin receptors, blockade of serotonin synthesis and direct micro-injection of naloxone into the mid brain; all of these experiments reduced acupuncture analgesia. Enhancement of serotonin synthesis increased acupuncture analgesia. An experiment measuring serotonin showed an increase product (serotonin) was released during acupuncture analgesia along with noradrenelinecture endorphin mechanisms verifying and supporting acupuncture analgesia. Acupuncture works in approximately 70% to 80% of humans and animals. Meanwhile, we know that the placebo only works 30% of the time. Acupuncture does not work all the time in all people for various reasons. Principally due to cholecystikinin (CCK). Those individuals with high CCK are poor responders to acupuncture analgesia. Good responders have less CCK. CCK blocks acupuncture tolerance, it acts in the periaquaductal gray. Animal experimentation have been done to show that poor responders may become better responders through the use of a CCK antagonist and that good responders can become poor responders by the use of cDNA, CCK gene. Acupuncture has been shown not to be physiologically addicting. Acupuncture is however additive and cumulative in its effects. It is more powerful after ten to fifteen treatments. Neurologically we know acupuncture works with a small mylenated fibers A delta-type III, and it does not work on larger fibers, C-fibers. In conclusion, acupuncture has been used for over 5,000 years. It has a large body of empirical anecdotal evidence indicating its effectiveness. Now, scientific based research evidence indicates there are several causes and effects of acupuncture. Acupuncture has been shown to be effective for acute and chronic pain conditions. Acupuncture has also been found to be effective in the treatment of addiction and withdrawal from various drugs, gastrointestinal functions, environmental illnesses and cardiovascular illness, along with positively changing learning/memory, conditioning and immunology. As a result of this research, more and more physicians outside China are using acupuncture to treat many painful conditions. It is estimated that 5,000 MDs in Germany, 30,000 in France and 60,000 in Japan use acupuncture along with drugs, nerve blocks and other approaches to treat patients with chronic pain. Here in the United States, over 1,000 physicians and surgeons are actively involved in the practice of acupuncture. With increasing research and evidence, more and more physicians in the West will become acupuncture practitioners.